1886-1905 autograph album of Ethel M. Benner of Waldoboro, Maine. 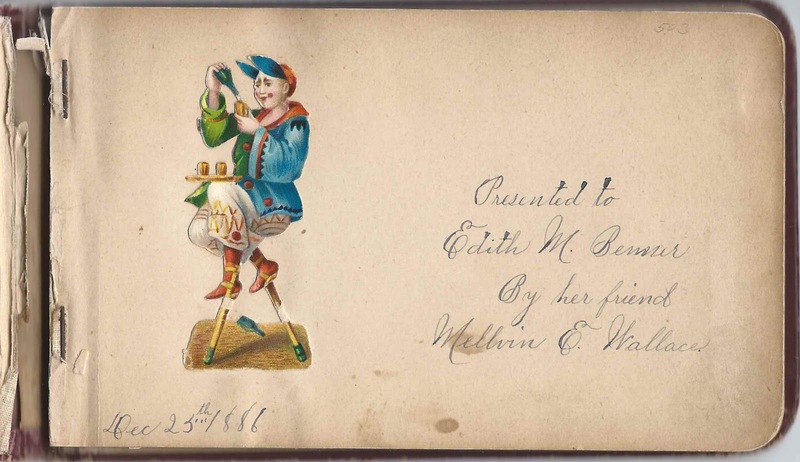 She received the album from friend Mellvin E. Wallace at Christmas in 1886. 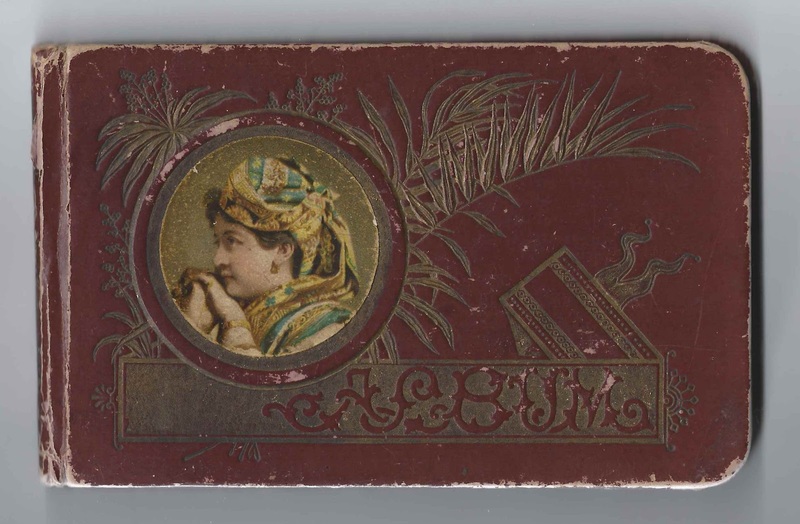 The album is approximately 7" x 4-1/4" and contains the sentiments of 35 of Edith's relatives and friends. An alphabetical list of the signers appears at the end of this post. The family history of many of the signers reflects their heritage in the Broad Bay settlement, founded in the 1750s by German immigrants to Maine. I believe that the album owner Edith was the Edith M. Benner who was born about 1871, the daughter of Alden Thomas Benner and Margaret Mary (Hoffses) Benner. If so, she was likely the Edith M. Benner who lived with her brother Joseph Benner, as shown in the 1920-1940 Censuses of Waldoboro, Maine. However, there was another Edith M. Benner in the area and a woman named Ethel M. who married a Benner. There's a marriage intention for an Edith M. Benner and Herbert J. Parsons, filed 13 December 1887; whether a marriage eventually took place, or not, I don't know. As you can see from the comments section, a reader indicates that Edith M. Benner and Herbert J. Parsons did not complete their marriage plans. Whether the album owner is that same Edith M. Benner or not, I don't know, but it's interesting that Herbert inscribed a page in this album on January 30, 1889. 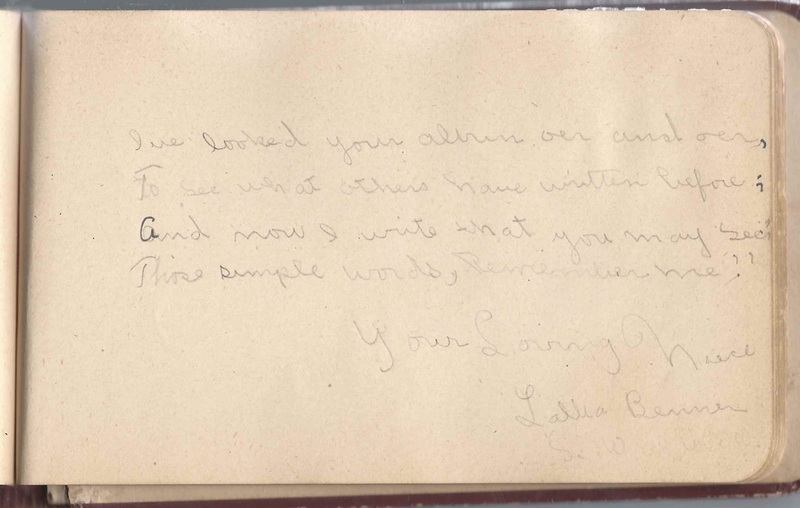 There is a clue in the album, the page signed by Lallia Benner, who called herself Edith's niece. 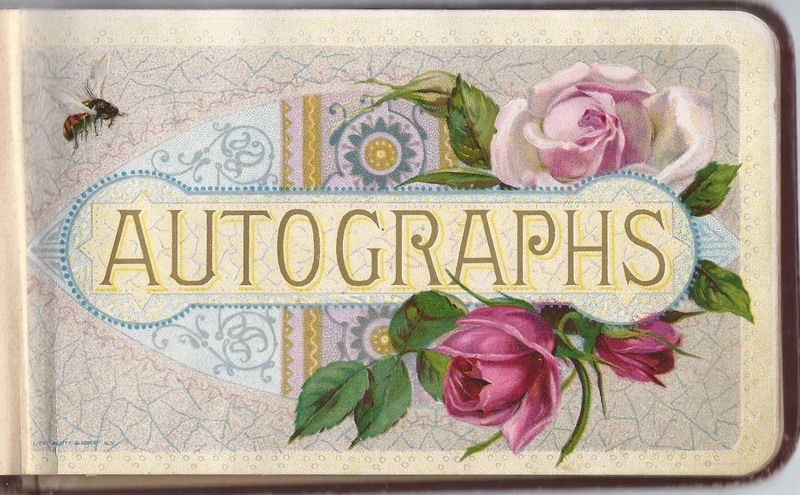 Most of the autographs are signed by people living at or visiting Waldoboro, Maine, in the 1880s and 1890s. 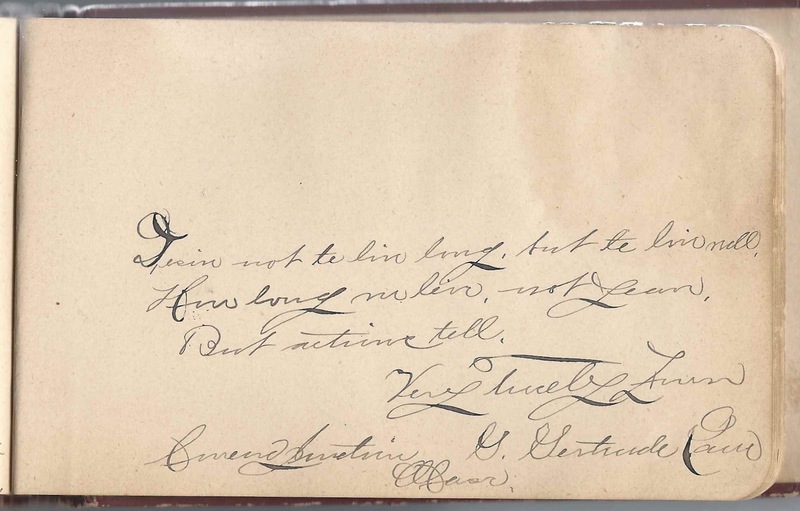 For instance, Theron S. Achorn of Waldoboro, Maine, signed a page on March 10, 1888. Sadly, Theron would die a couple months later on May 21, 1888. 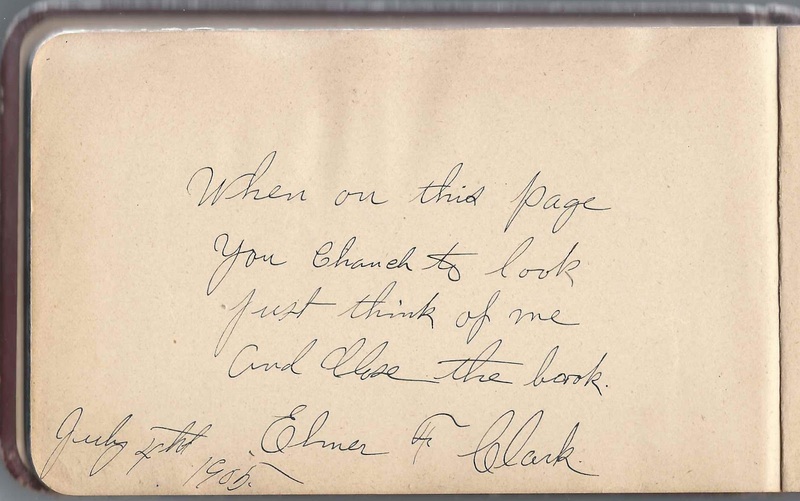 The latest page that signed by Elmer F. Clark on July 4, 1905. When I was trying to tease out the identity of album owner Edith M. Benner, I found a woman by that name in the 1900 Census of Rockland working as a cook. In the same household/establishment was another woman by the name of Lizzie R. Googins. 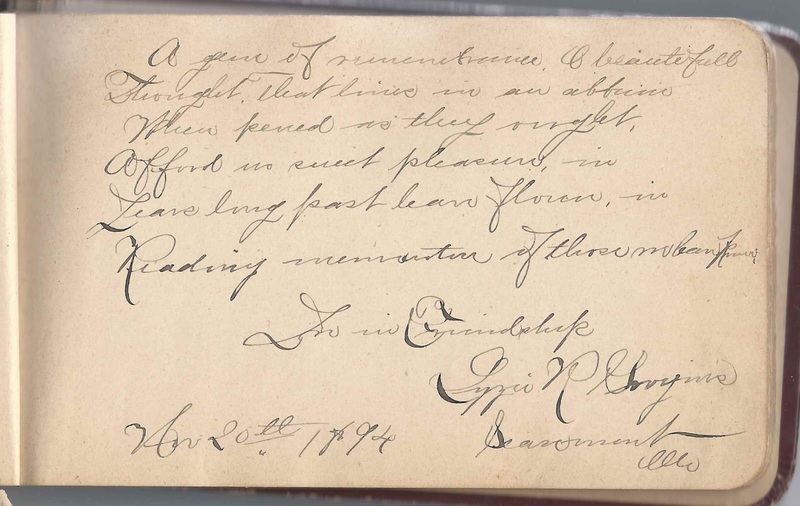 Interestingly, a Lizzie R. Googins of Searsmont, Maine, signed a page in the album on November 20, 1894. If you have a theory as to the identity of album owner Edith M. Benner, or information on any of the signers listed below, please leave a comment or contact me directly. Thanks! Below, a page signed by a person whose name and address are not clear to me. She is G. Gertrude ?, from, possibly, Concord Junction, Massachusetts. Perhaps a reader will recognize enough to be able to identify her for us. 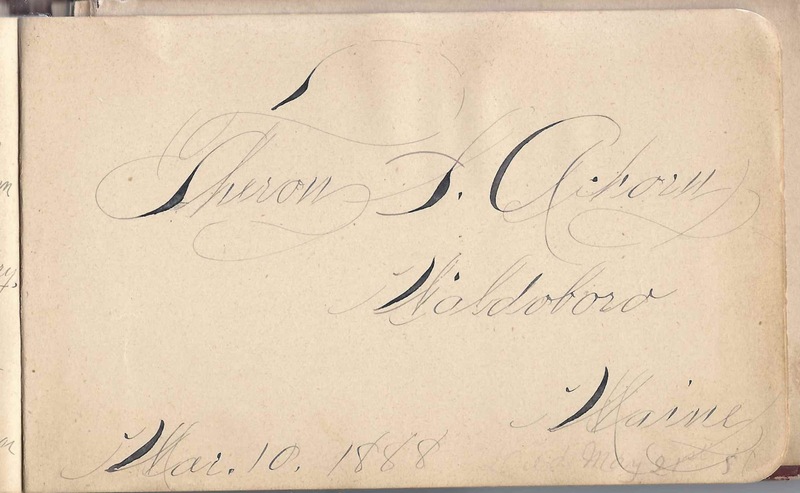 Theron S. Achorn of Waldoboro, Maine, signed on March 10, 1888; sadly, Theron died on May 21, 1888. Catherine Allen, signed at Waldoboro, Maine, on June 16, 1888; middle initial could be R or B.
Susie E. Carter of Cutler, Maine, signed on August 18, 1894. She's shown in the 1880 Census of Cutler, Maine, living with A. P. Gilson and wife Sarah M. (Sevey/Seavey) Gilson. Was Sarah Susie's mother? Edith M. Creamer of South Waldoboro, Maine, signed on "6-8-87"
Mary F. Hall of Waldoboro, Maine, signed on September 3, 1888. She was Mary F. (Hoffses) Hall, whose husband James Warren Hall signed the right facing page. They married 1 January 1856 at Waldoboro, Maine. J. W. Hall of Waldoboro, Maine, signed on September 3, 1888. He was James Warren Hall, whose wife Mary F. (Hoffses) Hall signed the left facing page. They married 1 January 1856 at Waldoboro, Maine. Isabel M. Hoffses of South Waldoboro, Maine, signed on January 15, 1887. Martha C. Potter of Waldoboro, Maine, signed on September 1, 1888. She was Martha J. (Currier) Potter, whose husband David Woodbury Potter signed the right facing page. D. W. Potter of Waldoboro, Maine, signed on September 1, 1888. David Woodbury Potter, whose wife Martha C. (Martha J. Currier) Potter signed the left facing page. Elmer F. Clark (b. 1875, St. George, Maine) was my g-g-g- uncle. He was a brother to my g-g-grandmother Nettie (Clark) Mills (1869-1918) and the youngest child of Andrew J. and Mary Fales (Wheeler) Clark of St. George. He married Lizzie (Elizabeth?) Googins on Jan. 2, 1905. However, I know nothing about her. They had a son named Forrest Clark. Edith M. Benner was my 3rd great aunt. You are correct that Edith and Herbert Parsons did not get married, however intentions were filed December 1887. 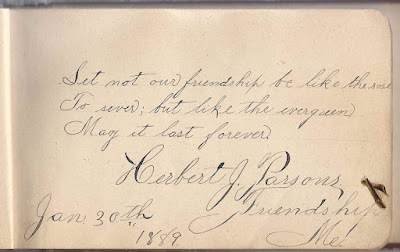 I find it interesting that Herbert Parsons signed Edith's autograph album in 1889. Thank you for the clarification, Patricia. I added an amendment to the post and included the image of the page that Herbert J. Parsons inscribed. Did your Edith have a niece named Lallia Benner?